For years, hen parties have been synonymous with a naughty weekend of pre-wedding debauchery with your nearest and dearest, but more and more, brides everywhere are looking for healthy hen party ideas to add a touch of wellness to their weekend! Whether you’re adding some action-packed activities or a touch of zen to your hen weekend; staying tee-total and embracing the ‘Mocktails’ or even making the most of the great outdoors with your bride tribe, there are so many different ways you can add a bit of health to your hen do. 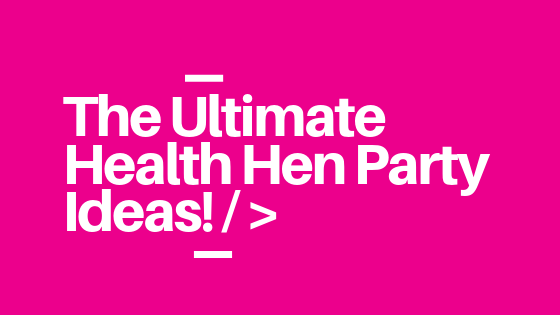 If you’re wanting to go for a whole weekend of wellness, or just fancy adding a sprinkle of good behaviour to counteract a weekend of cocktails, we’ve compiled our top tips on how to plan the ultimate healthy hen! If you’re planning a hen weekend in the summertime, what better way to get active with your bride tribe than with an outdoor hen activity? Breathe in the countryside air, take in some of the beautiful scenery, and get your limbs moving, and blood pumping. Perfect for any bride’s looking for something a little bit different. Why not hire a lodge or ‘hen house’ somewhere slightly off the beaten track? Whilst city breaks are a popular choice for hen parties at the moment, heading somewhere out in the countryside can be a fantastic idea. Hen Houses (https://www.henpartyvenues.co.uk) has tons of great options for groups of all sizes. You could even try to find somewhere with a cheeky hot tub or swimming pool and really embrace the luxury of somewhere slightly more remote! We can even bring our dance classes out to you if you hired out a hen house in the countryside! All you need is a bit of space to boogie, and we can organise the rest. A morning or afternoon walk with your hens can be a great way to get everyone moving. The perfect opportunity to see some of the countryside, and a great way for everyone to get chatting and get to know each other. You could spice up a countryside hike with a hen party sing song. Make a list of the bride’s favourite tracks before you head off, and sing your heart out! Why not incorporate a hen party game into your walk, and try a scavenger hunt, or a hen treasure hunt? If you want to ramp up the activity level out in the countryside then you could try mountain biking a go. It isn’t for the faint hearted and is certain to build up a sweat, but this thrilling activity is sure to have your heart racing, so again is great for all the adrenaline junkies out there! An obstacle course or a Go Ape course are also great ways to add a touch of adrenaline and activity into your countryside hen party! ‘If you’re planning a hen party on a budget, why not create your own hen party obstacle course or sports day races? An afternoon at the spa is the perfect way to add a bit of TLC to a hen weekend. Spa breaks are incredibly popular for hen parties and with very good reason! Whether you’re choosing to unwind with a facial and a glass of bubbly, or a massage and a superfoods juice, there’s something for everyone to enjoy. Spas can be a great choice, as everyone can pick their own treatment and find something to suit them, whilst the Jacuzzis and pools are a brilliant way to have a girly gossip and catch up. If you’re planning a hen party on a budget, or are staying out in the countryside, you can bring the spa to you! You can organise a massage therapist to come to the house, bring your own face masks and other delicious scrubs, lotions and potions, or if you’re lucky enough to have a hen house with a hot tub, get your bikini on and soak up the bubbles! *Top Tip! * ‘Make – A – Mask’ – A fun, healthy hen party game for everyone to get stuck into. Lay out a table of ‘ingredients’ have a competition of ‘who can make the ultimate face mask?’. Home-made facemasks are all the rage and have so many benefits for your skin. Popular ingredients include Banana, Oats, Egg Whites, Coconut Oil, Honey and Avocado! If you’re choosing to hit up the coastline or beach whilst for your hen weekend, then ‘Coasteering’, paddle boarding and surfing are all great ways to get outside and appreciate the stunning areas of coast that the UK has to offer. Now, first things first…..what the heck is ‘Coasteering’? ‘Coasteering’ is all about finding your way around the coastline, whether it’s by scrambling along the coastline, swimming, or cliff jumping one thing is for sure, this is a great activity for any active adrenaline junkies out there. Paddle boarding might be considered a gentler option for those looking to enjoy all that the ocean has to offer at a slightly slower pace but is definitely still a great workout for your core and shoulders. If you’re in the right area (hello Scotland, we’re looking at you), you might even get lucky and spot some sea lions or otters while you explore some coastal caves! Lastly, a personal favourite of mine, surfing is a fantastic way to get out in nature, workout, and I can guarantee that no one can help but find themselves grinning from ear to ear when they catch their first wave. Most surf schools now provide lessons and the necessary equipment for all of these options, and with a quick bit of research, you’re sure to find one that can help you to plan an activity for the group. Now, what better way to get active on your hen weekend than with a good boogie with your mates? We might be a little bit biased, but we think hen party dance classes are a fantastic way to get moving, whilst having a giggle with the rest of your bride tribe! Whether you’re looking to learn the Beyoncé Single Ladies routine, nail the Dirty Dancing lift, or you’re after a bespoke dance class, we can help you to create an unforgettable class that will cater to the needs of each individual group, whether you’re a seasoned pro or a complete beginner. Not only is it a great laugh that’s guaranteed to leave everyone smiling, but dancing is such a great way to get the group moving, letting their hair down and is a fantastic whole-body workout. Check out our dance experiences and see what dance class would suit you today? Although Prosecco, G&T’s and cocktails are often seen as a staple for a hen weekend, more and more brides are opting for a tee-total last weekend of freedom. Why get creative and have a ‘Mocktail-Making Competition’ with your hens? Get the bride ‘blind taste testing’ and judging who she thinks makes the sexiest mocktail! If your bride is a fitness fanatic, or keen yogini, then you could really throw yourself into a healthy hen weekend with a yoga class, or even with a bride to be bootcamp. A yoga class is a sure-fire way to help everyone chill out, switch off, and find their inner zen. It’s not only great for mindfulness and helping you to relax, but also can help to strengthen and tone your muscles, whilst helping to work on your flexibility. A brilliant activity for a Sunday morning, either to blast out some of the hangovers from the night before, or (if you’ve opted for a tee-total Saturday) to start your morning off with a sense of calm, serenity and stretch. Get Your Blood Pumping With Hen Party Bootcamp! Whilst this next idea might have some hens running for the hills, for a fitness fanatic bride-to-be, a boot camp or sports day themed activity could be the perfect way to start your weekend off! Whether you choose to create your own sports day, hit up the gym, or get an army style fitness instructor to come to your hen house, for hens that fancy a challenge, it’s a brilliant way to get stuck in and fully embrace an active hen weekend. If you’re a foodie bride but aren’t wanting to pile on the calories on your hen weekend, then why not get creative with some cooking challenges? You could book in some cooking classes, and learn how to make some new, fun healthy treats, or hold your own cooking competition at your hen house. Whether you want to go old school with a ‘Ready Steady Cook’ Game, or stay up to date with some ‘Masterchef’ style cooking challenges, it’s a guaranteed giggle, and a great way to get creative, whilst keeping your hen weekend healthy! A Sprinkling of Wellness – 5 Easy Top Tips for a Healthier Hen Weekend! Whilst a completely healthy hen weekend is becoming an increasingly popular choice for bride’s everywhere, it may not be everyone’s cup of tea. If you’re still wanting to include treats throughout your weekend, we’ve compiled a – quick fire top 10 list of how to add a ‘Sprinkling of Wellness’ into your weekend without too much effort! Stave off the hangovers and keep everyone hydrated throughout the hen by keeping the water flowing throughout the weekend! When you’re dashing from activity to activity, it can be easy to forget to top up, so why not get a water bottle for everyone at the start of the hen? You could even get some gorgeous personalised designs. Makes a change from a personalised T-Shirts! Whilst most hen’s go for taxi’s to get from activity to activity, you can save some pennies, hassle and often time by walking from place to place. Whether it’s at the club, or in one of our hen party dance experiences, having a boogie with your besties can be the perfect way to get active on a hen weekend. So jump in and start throwing some shapes on the dance-floor, it’s the perfect way to get giggling and add a dash of health into a hen! Having little snacks throughout the afternoon is a brilliant way to stay a little healthier by lining your stomach, keeping energy levels up, and keeping junk food at bay. Smoothies are the perfect snack to have on the go. You’ll get in one of your five a day, keep your sugar levels up and stave off the urge to grab a processed snack. A smoothie just before a night out could well stop a tipsy trip to the kebab shop at 4 am! Whilst an action-packed Sunday morning might seem like a good idea at the time of booking, it might be best to take a step back and think realistically how you might all be feeling at 11 am after a big night out! It might be a good idea to get the more strenuous activities timetabled for earlier on in the hen when you’re feeling fresh and raring to go. That way everyone will be more inclined to get stuck in, and really enjoy getting active altogether! Whatever you end up doing, always remember that a hen do is a once in a lifetime event where you can celebrate the bride and enjoy spending quality time with those special to you. Whether you want to opt for a fully healthy hen or just a ‘sprinkle of wellness’, balance is key and the main focus should be giving the hen an amazing weekend!